Now we will convert your shown in the left side to the new one shown in the right. it is very easy. We will discuss step by step illustrations and screenshots are given for better understanding. Now let's get started. software that support pallet editing. 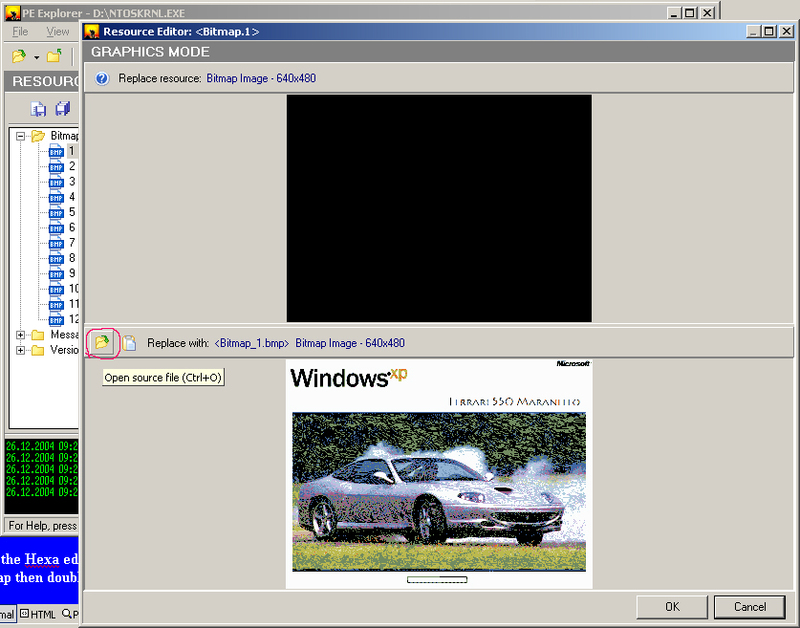 4.PE Explorer or any resource editing software. 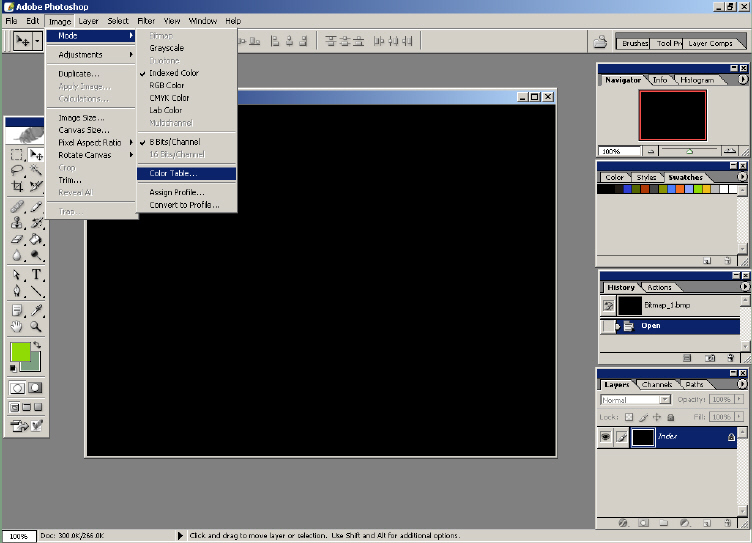 Then expand the bitmap folder and click on the bitmap numbered 100 as shown on the picture right click on it to show the above shown menu. Now click on "Save Resource As ..." a file save as dialog box will open give the file a name and save it in the working directory. Now save the Bitmap numbered 8 in the same way. You must be thinking me mad for saying these blank black color page a bitmap image. Then just wait and watch to find who is mad ! !Now open the bitmap in Photoshop CS. It will obviously look like this. Now goto image mode you'll sea the Indexed color option checked automatically. Now click on the color table menu to open the color table dialog box. Now click on load and load the color table give with this tutorial named 16.act.Voilla the image came out of nothing.It'a magic.No it's logic. 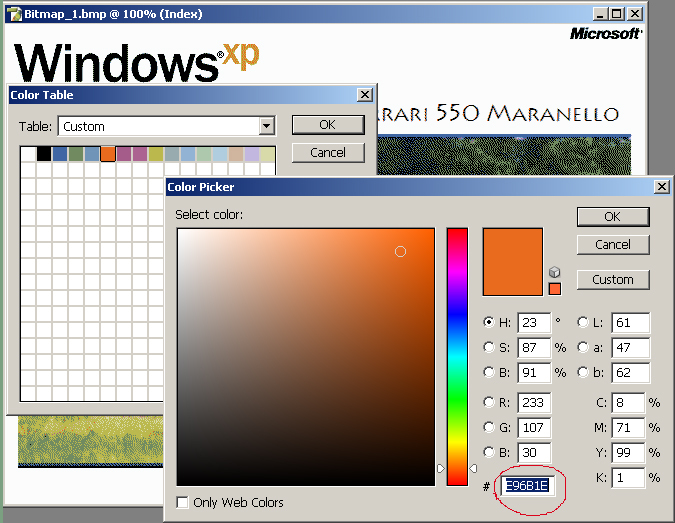 However won't you ask from where do I get this color table.Ok I extracted the colors from the file"NTOSKRNL.exe".How? It's a long story. I don't want to boar you. Have look at the image below. Now you can see the rear image that shows up when you boot your PC.Now change it into any thing you like here we want to make a Ferrari boot screen.so open the bitmap in Photoshop CS. Now in the same way open the color table dialog box. Upon clicking on any color in the color table will open the color picker where the number in the bottom represents the HTML color code for that specific color. Now if you have read my theories and concept section.Then you can easily convert if into a Hex string, using the give C code, that we can directly use. 4EB9BB00AFAB9800D4B39300ADC8AD00DECDAF009EB5D000DFB7C200A9DAD8"Search for the default color hex value in the Hexa Dump of the file in Hex editor and replace it with the above one. So the colors are saved in the file now we'll edit the position. (Notice here one thing that the first color is the background color i.e. if we will replace the positions of FCFCFB and 000000 then a black rectangle will appear in the top left corner of the screen.) So according to your version of "NTOSKRNL.exe" (I have service pack 2) Search for the Hex value mentioned in my previous tutorial for Progress bar position editing. Then locate the values that we want to change. Now open the image file in paint brush select the pencil tool and move it to the position where you want the progress bar to be placed. You can also zoom the picture to have a greater precision. Note the Y Co-ordinate of that position. Now follow the procedures written in the tutorial Progress bar position editing to get the Hexadecimal top and bottom values of the progress bar (They will be C9 for 62 and D1 for 6A) and replace them in the file. So that it will look like this. . .
Now then Hexa editing part is over. From now onwards it is very easy. open the file "NTOSKRNL.exe" in PE Explorer and navigate to bitmap then double click on it. A replace resource dialog box will open. Click on the "Open source file" button and browse for the image and open it. Now clink "OK" a message box saying "Value have been changed. Do you want to proceed ? "will come up click "Yes". Do the same for any other images if you want. "Professional" that you see is due to this bitmap. Now since you don't need this any more, as your main page if self-sufficient and doesn't need any overlays, you have to delete it. So select the bitmap numbered 10 and click on the Red Cross button in the tool bar of PE Explorer. The specified bitmap will be deleted. Now click on the "Save file as . . ." button and save the file in any location you wish. If the file didn't start downloading after clicking on these links then copy-paste the links in the address bar and press enter.This will definitely start the download. Please feel free to ask me any questions. My E-mail ID is jitun2@yahoo.com. Bye. . . Bye. . .